A book-length project of contributions by multiple authors that aims to collect writings which investigate, uncover, examine, complicate, question, spoof, spark, incite, meditate, mediate, mix, sample, nettle, navigate, question, provoke, and otherwise (essentially) challenge pedagogical strategies pursuant to the work of teaching writing and other disciplines. This book includes writings which dream up, concoct and explore utopian, fabulist, fantasy syllabi for potential imagined or real classroom endeavors: Educational projects undertaken and employed (deployed) in and outside of official as well as mongrel “schools.” Official spaces might harbor (or cultivate) the mongrel & vice versa. • Sample syllabi that have been implemented or might/could be implemented AND the opposite of this condition: wholly fantastical stuff more suited to investigations in outer space and other sociocultural vacuums. 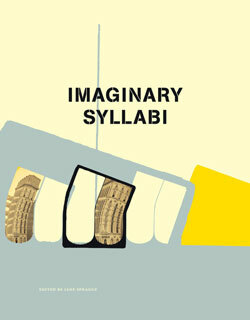 • Syllabi composed entirely of images or text or some combination of both. Syllabi may be scattered or comprehensive lists of pertinent, esoteric, weird or terribly useful URLs. • Documents from classroom practices that were successful, compelling, disturbing etc. and which their authors wish to share, distribute, make known. • Essays/Syllabi that mention other teachers and communities of teachers &/or documents, critiques, etc. &/or explore and extend the work of other teachers and communities of teachers, theorists, scholars, activists, revolutionaries, radicals, & intellectual insurgents.... There is no intended fixed, predetermined or official meaning attached in this CFW to the word “teacher”; “A thing which shows or points something out…”; teachers are sometimes not necessarily human organisms. • Writings that disclose, assay, weigh the idea of the “syllabus” itself. • Unimagined documents for unimagined learners among whom we could also group teachers / professors / instructors / mentors / advisors / and so on. The intent of this project is to spur and develop a sense of critical inquiry, partnership, collaboration, critique and rebellion that the final book object also aims to cultivate among and within its readers. yay, so glad this is live! been looking forward to this for a long time... a title certainly for my poetry, politics, pedagogy course!